(17/P3) TRENTON – The Christie Administration today announced that the Department of Environmental Protection has approved a plan that requires the removal of approximately 50,000 tons of slag and baghouse dust containing low levels of radioactivity from the Shieldalloy Metallurgical Corp. site in Newfield, Gloucester County. The decommissioning plan calls for construction of a short rail spur to link with an adjacent freight rail line so that the materials, covering some seven acres of the site in this small borough just north of Vineland, can be taken by train to federally approved disposal sites located out of state. Shieldalloy produced specialty steel and alloy additives, powdered metals and optical surfacing products at the site for decades before phasing out operations in the late 1990s and early 2000s. 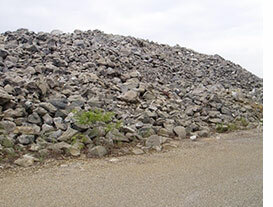 The metals-extraction process produced a rocky by-product known as slag and a fine material known as baghouse dust that contain low levels of radioactivity. Both materials have been stored on the eastern side of the site for many years. One of the metal ores used as a raw material contained small, but regulated, amounts of radioactive uranium and thorium. The storage area contains nearly 38,000 cubic yards (more than 44,000 tons) of slag and more than 15,400 cubic yards (or 7,000 tons) of baghouse dust. A cubic yard is roughly equivalent to the size of a large kitchen refrigerator. For decades, the materials were stored under a license issued by the federal Nuclear Regulatory Commission (NRC). 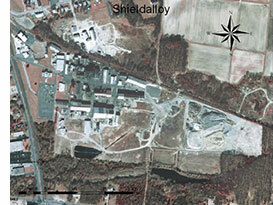 As it was phasing out operations, Shieldalloy submitted a decommissioning plan to the NRC proposing to cap the materials and leave them on-site in perpetuity. In 2009, however, New Jersey became an NRC Agreement State, meaning the federal agency granted the state authority to regulate hundreds of NRC-licensed sites and facilities. Shieldalloy initiated court actions challenging the transfer of regulatory oversight of its site to the DEP. Federal courts twice remanded jurisdiction of the disposal area back to the NRC. But the state persisted and in December 2014, the U.S. Circuit in Washington D.C., gave the DEP regulatory authority over the Shieldalloy license. Since that time, Shieldalloy has been working cooperatively toward a decommissioning plan acceptable to the DEP. With the approval of the removal plan, Shieldalloy has 60 days to solicit bids and hire a removal contractor. The work plan detailing the removal process will be due nine months after the award of the bid and will specify facilities where the materials will be shipped. The actual removal of the materials is expected to take several years. In addition to the radiological cleanup that is under DEP jurisdiction, Shieldalloy and a contractor are working actively with the U.S. Environmental Protection Agency’s Superfund program in separate actions to remediate non-radiological contaminants in soil, sediments, and groundwater at the site.